Otterbein President John Comerford (right, standing) looks on as Corrine Burger of JPMorgan Chase announces a fintech partnership with the university. 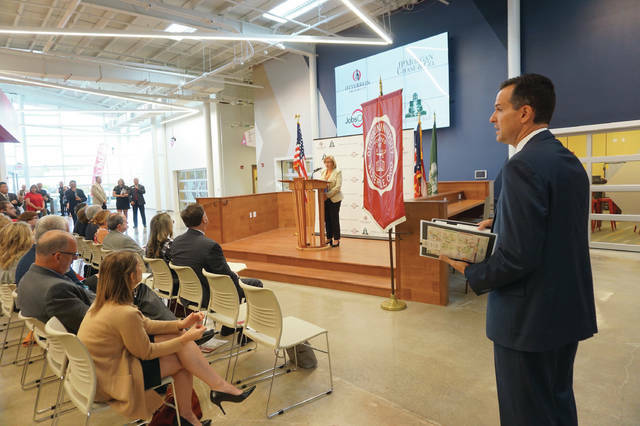 The Point at Otterbein University — a building that already houses the university’s STEAM (Science, Technology, Engineering, Arts and Math) program — can now add fintech (financial technology) to its resume. Otterbein announced on Friday a partnership with JPMorgan Chase & Co. that establishes a fintech research and development arm at The Point. The partnership means Chase will use three spaces at The Point for its staff and Otterbein students to collaborate on fintech R&D, including design, robotics, system engineering, software development, testing and support, and user interface. Chase will join five other tenants at The Point: edgeThingz, ERCO (Educational Robotics of Central Ohio), Nestle, Nikola Labs, and PolymerOhio. Also, Chase employees will teach some courses at Otterbein, as well as serve on the university’s computer science advisory board. Officials have said the partnership will generate 75 to 100 full-time jobs. “Our partnership with JPMorgan Chase is an example of the Otterbein model for a 21st century liberal arts education,” said Otterbein President John Comerford at the announcement. “Our town-gown relationship with Westerville is now stronger with the addition of JPMorgan Chase as a leading business partner at The Point. This partnership will allow our students to have R&D experience and increase their critical thinking to new heights. More than 250 Otterbein alumni currently work with Chase in central Ohio. Also joining in the partnership is Westerville, since Chase is the largest employer in the city. Collinsworth and Comerford each praised the university’s previous president, Kathy Krendl, for her vision in turning what was once a storage facility into a STEAM learning center. In addition, JobsOhio has provided an R&D Center Grant to The Point at Otterbein. With the increase of online and mobile banking, tellers and brick-and-mortar locations are getting less use, which is reflected in the design of newer Chase locations, such as the one currently being built in Sunbury.